It's obvious that Orb will go off as odds-on favorite in the 2013 Preakness Stakes, but I am not entirely certain that's the smart money, even if on paper the Kentucky Derby champ appears best in a 9-horse field. There are two new shooters in the mix -- Departing and Governor Charlie - that drew my attention, even though both come out of less-than-spectacular fields in their prior races. Departing is my top choice and, in my opinion, will be grossly overlooked on Saturday. 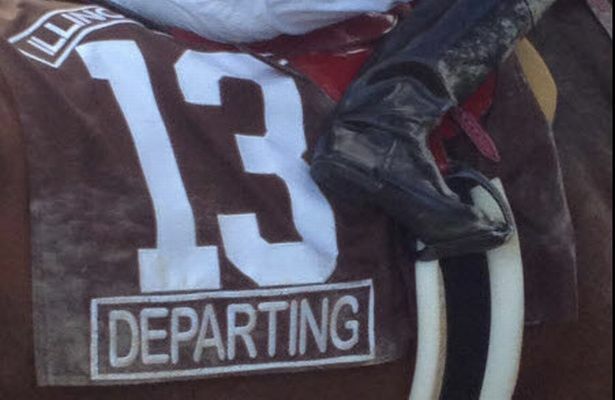 As of late Friday, Departing was getting little respect as well on Public Handicapper's odds board at 11-to-1, nearly double his 6-to-1 morning line and third-highest on the board, just ahead of Oxbow and well ahead of Titletown Five, whom Bart Starr and Vince Lombardi could not even save in this spot. In my opinion, Departing has done nothing wrong, having won 4 of 5 career starts, including the Grade 3 Illinois Derby in convincing 6-wide fashion, and was full of run but compromised late in the Grade 2 Louisiana Derby when rider Brian J. Hernandez rode up eventual winner Revolutionary's tail in the stretch and had to shift sharply twice but finished an engaged third. I simply think Departing's style fits Pimlico. The horse seems comfortable from a stalking position and seems easily capable of gaining ground late, as evidenced by as 12.3 final eighth mile in the Illinois Derby and outdistancing the competition by 3+ lengths even after running 6-7 wide. Whether Hernandez can steer his mount away from trouble is my primary concern, but I think Departing could loom large on Saturday. Governor Charlie drew my attention as well, and clearly trainer Bob Baffert owns this race, as evidenced by five Preakness titles, but the Sunland Derby was bereft of talent. The place and show runners in that field did little in their ensuing races. Still, this horse can easily get the distance while forwardly placed, and so I will use him and Orb under Departing in very small Preakness (Race 12) bets. The handicapping that I put into the Preakness revolved around this week's Public Handicapper all-stakes Pick 4 from Pimlico. Whether I'm alive to my egregious long-shot of the day is another question, but I really like the chances of 20-to-1 morning line shot See Tobe in the Grade 2 Dixie (Race 11). The Dixie has some big names - Willcox Inn, Optimizer and Swift Warrior -- to name a few, but in my opinion a lot of the 13-horse field is either somewhat off form (i.e. Grade 3 winners Doubles Partner and Humble and Hungry) or on the downside. As I see it, 7-to-2 morning line favorite Optimizer will get a ton of respect off his second-place finish in the Turf Classic at Churchill two weeks back, and 4-to-1 Swift Warrior will take money as well off two straight Grade 3 wins, even though those races were at Tampa and Sam Houston - not world-beaters. If the Public Handicapper odds board is any indication, horseplayers will dismiss See Tobe, the second-longest shot as of Friday evening at 57-to-1. I would take those odds any day. See Tobe's running line will reflect primarily a local Maryland-New York type runner with lots of runner-ups against perceived lesser company. Five races back, however, See Tobe showed good late kick to finish second to Boisterous, a multiple graded stakes winner with $800k+ of earnings, in the Grade 3 Knickerbocker. Toss his 2013 debut and note the decent late-running fifth to some good horses like Bad Debt and Sleepless Knight eight days later and I think you've got a bomber with a serious shot to upset. The first two legs of Saturday's all-stakes Pick 4 are far less exciting, in my view, but I'm sure I'll be kicking myself for leaning toward back-to-back Rudy Rodriguez runners in the Grade 3 Gallorette Handicap (Race 9) and Grade 3 Maryland Sprint Handicap. In the Gallorette, Silver Screamer gets the nod for me at 8-to-1. Perhaps the "No Rider" notation for Silver Screamer's jockey explains why he's 18-to-1 on Public Handicapper, but I'm willing to roll the dice on a horse who fired very well off his last two layoffs and I anticipate will benefit from drawing outside. This horse, assuming he's still in on Saturday and finds a rider, seems capable of stalking early pace, as evidenced in the 2012 Eatontown at Monmouth Park. Rudy's next runner, Sage Valley, may be a single for me in the Pick 4. After spending too much time assessing this field, I simply think Sage Valley is the best horse, and I'll be glad to take the 9-to-2 odds offered on Public Handicapper. I continue to waver on this one, but Laurie's Rocket looms the primary danger, in my view, and I may leave him off my tickets. Good luck to those of you playing on Saturday, and if you want to burn your money, there's no better way than following the sage advice of NJ Horseplayer.